The Center for Environment, Commerce & Energy (Center) went to China for two weeks to tour nuclear power plants and to examine other options for cleaning the air and reducing global warming. It is our belief that if China is not participating in global warming programs, then the programs are irrelevant. Although there are great challenges in the United States for achieving clean air and reducitions in greenhouse gases (GHGs), we believe China and the U.S. can cooperate to mitigate groundlevel smog and global warming. The Center is promoting the expanded use of nuclear power in China. There are ten nuclear reactors at six facilities currently operating in China with five reactors under construction. There are plans to build 30 to 40 more reactors in the next decade. Although this is an aggressive plan to expand the use of nuclear power, we believe it is inadequate to meet electricity demand and to reduce global warming emissions from China. The Center believes nuclear power has to be the cornerstone of any strategy for producing emission free electricity. As such, we designed a trip to China to examine their state-of-the art technology and current nuclear power plant building projects. We also intend to promote an accelerated nuclear power plant building program in China. Although there are plans to build about 30 plants over the next decade, we believe China needs to pursue a 'Great Nuclear Wall' that would include approximately 400 new reactors over the next two decades. China produced a 'Wonder of the World' by constructing the Great Wall. We sincerely believer that China has the genius and wherewithal to provide at least fifty percent of its electricity from nuclear power before 2050. The Center will also promote the use of carbon offsets based on increased use of nuclear power as a tool for mitigating global climate change. Nuclear power has been excluded as a source of offsets in greenhouse gas reduction programs in the United States and within the Kyoto Protocol. We will work to establish nuclear power as a legitimate source of greenhouse gas reductions through the use of the United Nations Certified Emissions Reductions (CER) and the Clean Development Mechanism. (CDM). China is currently examing the feasibility of partticipating in a Post Kyoto climate change treaty. Center President Norris McDonald and Vice President Derry Bigby began the trip to China by greeting Congressman John Conyers (D-MI) and Congressman Eni Faleomavaega at Dulles Airport and sharing our itinerary. We also briefly met with Congressman Conyers at the Hyatt Hotel in Beijing before his heavy meeting schedule. Congressman Conyers is Chairman of the House Judiciary Committee and was in China to meet with high-ranking government and business leaders for purposes of strengthening US-China relations. Congressman Eni Faleomavaega, Chairman of the Foreign Affairs' Subcommittee on Asia and the Pacific, was leading the congressional delegation, which also included Congresswoman Diane Watson of California. 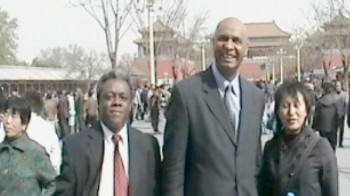 McDonald and Bigby met Center China Office Director Zhang Xiaoping in Beijing. Her translation services were invaluable during the entire trip. The Center recruited Ms. Zhang and established the office in China in 2006. The purpose of this office is to protect the environment in China, particularly in the areas of air pollution and global warming. The Center China Office gives us standing regarding environmental issues in China and serves to facilitate mutually beneficial projects with the United States. The office also provides us with efficient outreach capacity and translation services. The Center went to China for two weeks to examine environmental conditions, meet with industry and government officials and to examine energy and agricultural projects. The Center toured the new Generation Four nuclear technology being developed by Tsinghua University, a chemical manufacturing facility and the oldest and largest nuclear facility in Asia. The Pebble Bed Modular Reactor represents an almost entirely new way of using nuclear power to generate electricity. China is leading the way in developing this new Generation Four technology. Center staff received a complete technical briefing by Tsinghua University physicists from the Insititute for Nuclear and New Energy Institute (INET). Powerpoint presentations provided us with a comprehensive description of the project. The INET staff then drove us about 40 miles west of Beijing to the actual research reactor. There is a model of the PBMR in the foyer of the reactor building. We toured the control room for the reactor. INET is also developing other projects, including wind, fuel cell and wastewater treatment. Although we have a policy of not describing security measures at nuclear facilites, let us just say that the measures we observed were unlike any being utilized in the United States. China is developing a Pebble Bed Modular Reactor (PBMR) for power generation. The 10-megawatt prototype is called the HTR-10 and is being developed under a research program at Tsinghua University in Beijing. Most Chinese university rankings place Tsinghua first in China. Tsinghua Universitys Nuclear and New Energy Technology Program is also examining the feasibility of using the high temperature gas of a PBMR to crack steam to produce hydrogen, which can serve as fuel for vehicles. With the exception of South African utility Eskom, this is the only active development of PBMR technology in the world. Norris and Xiaoping are pictured at right in front of the PBMR building. China intends to commercialize the technology by building 200 MW modular PBMR units for use throughout the country. China plans to build two PBMR nuclear power plants in the coastal city of Weihai, in Shandong province, according to city officials. The two plants will be located in the Rushan and Rongcheng districts of Weihai. The projects are awaiting final approval. China will begin building a new generation pebble-bed nuclear reactor in Weihai with the aim of making the technology commercially viable by 2020. China plans to quadruple its nuclear generation by building 40 new reactors in the next 15 years. This plan is insufficient to to meet the electricity needs of China, particularly emission free generation. The Center believes China needs ten times this number of plants to meet Chinas electricity needs and to significantly reduce greenhouse gas emissions. The Center will promote a mix of nuclear technologies, including the Advanced Burner Reactor, to meet the electricity needs of mainland China and Hong Kong. China and the United States have signed an agreement that supports the transfer of nuclear technology to China. Westinhouse Electric Company wants to build 4 nuclear power plants in China. The agreement was signed by China's minister for the National Development and Reform Commission and U.S. Energy Secretary Samuel Bodman.Westinghouse wants to build facilities at Sanmen in Zhejiang Province and at Yangjiang in Guangdong Province. Westinghouse wants the plants up by 2013. Westinghouse wants to build its new AP 1000 nuclear power plant. Shaw Group Inc (Westinghouse's U.S. engineering and construction services contractor) signed a companion agreement with China's State Nuclear Power Technology Company to work out details for the contract and construction. The Center spent two days in Beijing at Tsinghua University to examine the Nuclear and New Energy Technology Program. We intend to discuss methods to assist in the commercialization of PBMR technology in China and the United States. Center staff met with CLP Holdings Limited in Hong Kong and met with Dr.Gail Kendall, Director, Group Environmental Affairs and Simeon Cheng, Group Environmental Manager to discuss environmental and energy issues in Hong Kong. CLP Headquarters is located on the 20th floor of the Grand Century Power in Mongkok, Kowloon, Hong Kong. Our group staryed in Kowloon instead of on Hong Kong Island. The CLP Group invited the Center to tour the Daya Bay nuclear power plant and to discuss energy and environmental projects. Founded in Hong Kong in 1901, CLP is one of the largest electricity investor-operators in the Asia Pacific region. CLP owns 25% of Guangdong Nuclear Power Joint Venture Company, Ltd (GNPJVC), which in turns owns the Guangdong Nuclear Power Station (GNPS) at Daya Bay. In Hong Kong, CLP operates a vertically integrated electricity generation, transmission and distribution business, which is regulated by the Hong Kong Special Administrative Region (HKSAR) government agency. With an installed generation capacity of 6,597.5 megawatts and a transmission and distribution network of some 12,000 kilometres. Guangdong Daya Bay Nuclear Power Station was the first, and is the largest, commercial nuclear power plant in China. The power station has an installed capacity of about 1,900 MW. It began operation in 1994 and CLP buys 70 per cent of the plant's output to supply Hong Kong's power needs and the balance is consumed in Guangdong Province. The nuclear power plant complex is composed of two power stations: 1) Daya Bay Nuclear Power Station and 2) Lingao Nuclear Power Station. The complex is located at Daya Bay about 28 miles (45 km) away from Shenzhen City and 31 miles (50 km) away from Hongkong. Current (2007) total capacity at the complex is 3,764 MWe, which will expand to 5,640 MWe when the two Lingao units go online. The United States should follow this example of placing six reactors in one location. Daya Bay Nuclear Power Station has two reactors and construction began on August 7, 1987: Unit 1 (944 MWe) began power operations on August 31, 1993 and Unit 2 (944 MWe) began power operations on February 2, 1994. The reactors were designed and built by the French national company, Framatome (with Chinese participation). Guangdong Nuclear Power Joint Venture Co., Ltd was established in 1985, invested jointly by the Guangdong Nuclear Power Investment Co., Ltd and Hongkong Nuclear Power Investment Co., Ltd, which was responsible for the construction and operation of the Daya Bay Nuclear Power Station. Daya Bay Nuclear Power Station was the first large-scale commercial nuclear power station in China with two 984 MWe pressurized-water reactor units at a cost of 4 billion US dollars. .
Lingao Nuclear Power Station is equipped with two 938 MWe PWR, with two additional reactors being brought on line (one under construction and plans for one more). As of April 2007 approval is pending from the State Council for the planned reactor. China Nuclear Industry 23rd Construction Corporation (CNI-23), one of main contractors, undertook the installation of the nuclear islands during the construction of Lingao Nuclear Power Station. The quantity of electricity produced at GNPS replaces the need to consume at least 3 million tonnes of coal per year, saving the annual discharge of at least 7.5 million tonnes of carbon dioxide, 150,000 tonnes of sulfur dioxide, and many thousands of tonnes of nitrogen dioxide and airborne particulates from a coal fired power station into the environment. Daya Bay has about 900 staff members for its operation and alll of the senior operators have to obtain a licence issued by the National Nuclear Safety Administration before they can start working in the control room. GNPS still maintains a small team of international advisors, most of whom are French engineers from Electricite de France. CLP made special arrangement for our tour and added students from Chan Wong Sok Fong Memorial Secondary School. They also arranged a very special lunch for everyone after the tour. The bus had to stop at an immigration office in Hong Kong as we left and another one in Mainland China right over the border. We had to repeat this going back to Hong Kong. Daya Bay is in Guangdong Province on the Mainland. M.T. Richard Fung, Technical Manager, Hong Kong Nuclear Investment Company, conducted the tour at the Daya Bay nuclear power station complex. He is completely knowledgeable about every facet of the complex and provided a thorough tour experience for the Center and the Fong Secondary School students. Mr. Fung started with a video at the facility theater and proceeded to the education center where he answered all questions. Mr. Fung then assured that all participants were well informed about the Daya Bay units and the Lingao units. Mr. Fung is pictured at left with Center President Norris McDonald and above right in the center with the Fong High School students. The Center spent two days with the Shandong Haihua Group (SHG). The Center has been in discussions with representatives of SHG about energy issues facing the company. SHG produces many chemical products, including: soda ash, industrial bromine, calcium chloride, silica white, sodium silicate solid, potassium sulphate, magnesium chloride, melamine, sodium nitrite, sodium nitrate, fire extinguishers, hydrogen peroxide, methanol, amino-resin, carbohydrase, zinc oxide sebacic acid, among other chemical products. SHG is located about 30 miles from Weifang City in Shandong Province. Representatives from SHG were instrumental in arranging for the Center to visit one of Chinas leading economic development areas. In addition to meeting with representatives of SHC to discuss energy and environmental needs, the Center will assess the needs of the entire Shandong Province and will make specific recommends to industry representatives and government officials.. The Center will examine the feasibility of getting investors to partticipate in mutually beneficial environmental projects with SHG. We toured the development area, including the Bohai Bay area. The Shandong Weifang Binhai Economic Development Area, a leading Chinese economic development agency, is commissioning SHG to build two additional 200 MW electric and thermal plants to meet future expansion needs. BEDA currently has a 250 MW integrated heat-and power plant to provide electricity and process steam. The Center was invited to discuss energy and clean air issues. BEDA was established in August 1995 and covers an area of 283 square kilometers (176 square miles). BEDA is the largest modern chemical industrial production and export base in China. BEDA has rich reserves of resources such as potassium, sodium, calcium, magnesium, bromine, and iodine. The Center will examine the feasibility of getting investors to participate in mutually beneficial environmental projects with companies in the economic development area. The Center is testing techniques for reducing greenhouse gas emissions from facilities in China. We will promote the adoption of nuclear power as the most effective technology for producing electricity without generating any greenhouse gases. According to the the International Energy Agency, China will produce more carbon dioxide than the United States by 2009. The Center wants to mitigate global warming and China has to be included in any strategies to do so to be successful. The Center is in the process of initiating a carbon dioxide offset program through our Green Carbon Dioxide Offset Bank (GCB). We are also promoting a Carbon Mercantile Exchange to facilitate reductions in greenhouse, smog forming and atmospheric ozone depleting gases. The GCB is a service that allows participants to reduce their "carbon footprint," the total carbon dioxide emissions created by driving, flying, using electricity and other activities. Nuclear power plants, like hydro and wind, do not emit any greenhouse or smog forming gases. Every time a carbon dioxide credit is purchased via the GCB, the credit holder will be designated with an equilavent fission credit certifying that the holder purchased emission free energy. We are promoting the utilization of nuclear power plants as a method for establishing carbon credits in China. The Center will promote nuclear power as a legitimate source of carbon dioxide offsets through the United Nations Certified Emissions Reductions program. GCB is also seeking certification for certain projects under the Kyoto Protocol's Clean Development Mechanism. We will also seek acceptance of the Green Carbon Bank offsets at the World Bank and Asian Development Bank.